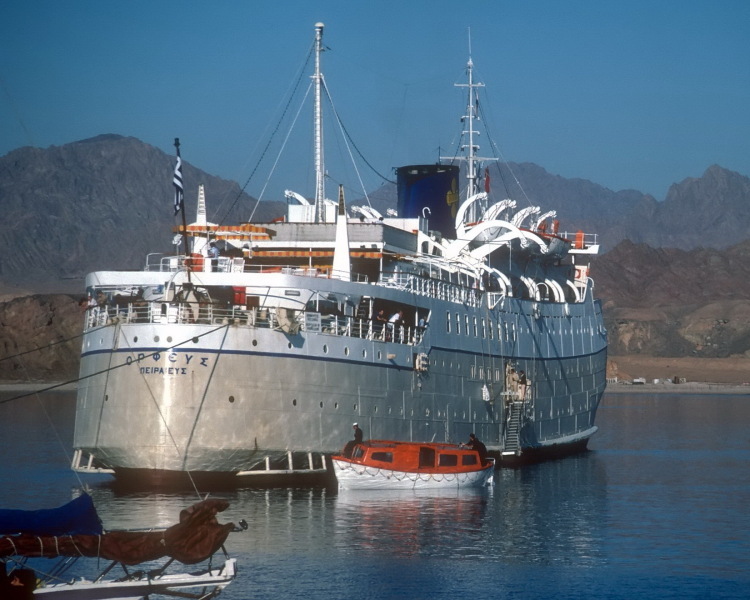 Swan-Hellenic chartered cruise ship 'Orpheus' @ Egyptian Sinai port of Sharm-El-Sheikh - 12 November 1986 [photo © WCK-JST] Kodachrome original. My parents, and my brother Jim (the photographer - Wett Coast on Flickr) were on board this ship at that time for one of Swan-Hellenic's eastern Mediterranean cruises. That is a really charming picture! and thank-you to the head master for not deleting this one! mrdot. these one time coastal boats didn't have all the amenities that modern cruise patrons demand, but it was a different kind of cruising in years gone by! and the ships had caracter for the old time shipwatcher! mrdot. Perfectly lovely. I like the way the sun strikes the hull plates. An image of cruising just the way in which I like it. This photo has been shown 1,806 times since it was added to the site.